The reason the birdhouse project was occupying my thoughts was quite simple. I had to make an adjustment and I had no idea how to tackle it. The sides were the toughest parts to create due to the complicated three paneled windows. I thought they would look quite good, why not then? The problem arose when after a day of completing the skeleton of the house I realized that it is too thick. Looking at it with fresh eyes I thought it would look much better if it were about 50% thinner. And that is when the dilemma started. What should I do with the windows? Should they stay or should they… there was not even an opportunity to finish the question. I worked too long on them, and I liked them far too much to simply trash them! And then the question comes: what to do? I though about it, thought about it and nothing. And then a couple of days later I suddenly realized all I had to do was change the original window design. 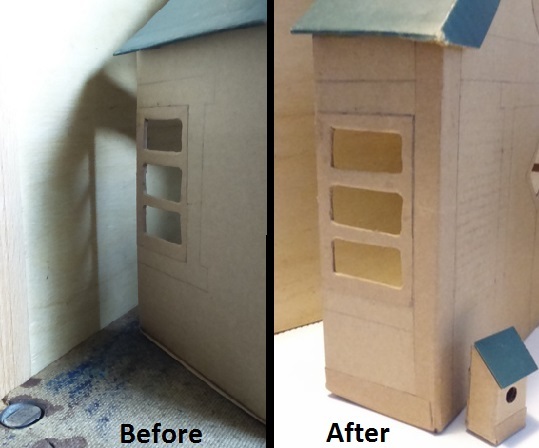 This would allow me to cut out a portion of the side panel – between the window frame and the corners – and glue the remaining part back on. Voila! That easy???? Once you know the how to, the what to seems so simple! Then came the chimney, now that I was so into the modification. When it all came together I knew I would not be able to wait another day to start experimenting with the color! 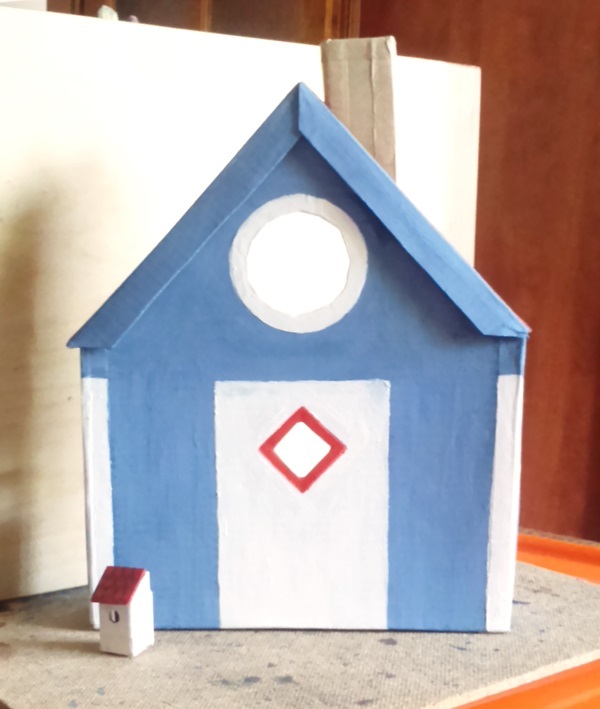 My husband suggested to mimic a blue house we saw in a book about Bergen, Norway, so blue it became! And such a beautiful color!